Right off the bat, there are two important things you need to know: 1.) I strongly dislike chicken pot pie, and 2.) I love my husband dearly. Despite thing #1 above, thing #2 (and a lightning strike idea recently, in which my brain suddenly screamed “You could use CHEDDAR BISCUITS as a chicken pot pie crust!”) compelled me to make a chicken pot pie last night… and from what I’m told, it was mighty tasty. 1.) Heat a large skillet or pot over medium heat, and add the olive oil to it. Chop your chicken into bite size pieces, season it with a generous pinch each of salt and pepper, and add to the pot. Cook the chicken until nicely browned and just cooked through; remove to a paper towel-lined plate. 2.) Add the carrots to the hot pot, and cook until the edges are starting to brown, about 2 minutes. Season with salt and pepper (a pinch each); add the onions, and cook both until they are lightly browned and slightly softened, another 3-4 minutes or so. Add the garlic, and cook until just fragrant, about 30 seconds. 3.) Preheat your oven to 425°. Add the 2 tablespoons of butter to the vegetables in the pot, and allow the butter to melt. Once it has melted, sprinkle the flour over the vegetables, and stir until all the flour is moistened. Allow the flour-coated vegetables to cook for 2-3 minutes, to cook out the raw flour taste. 4.) Pour the chicken stock into the pot, and use a wooden spoon to stir and scrape up all the browned bits from the bottom of the pan. Allow everything to come to a simmer, and add the heavy cream. Add the chicken back into the pot, and allow the sauce to simmer until it has thickened slightly, 4-5 minutes. 5.) 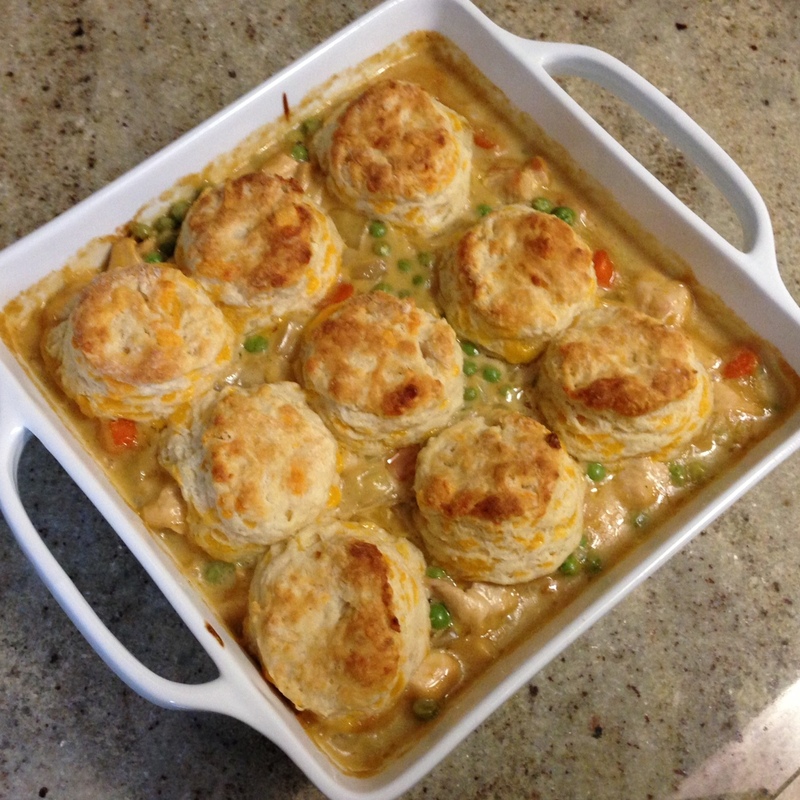 While the chicken and vegetables are simmering, make your biscuits (the method is here – stir the cheddar in at the same time as the buttermilk). 6.) Add the peas to the chicken and vegetable mixture, stirring them in. Pour the mixture into a baking dish, and evenly space the biscuits across the top. 7.) Bake for 15-20 minutes, until the biscuits are nicely browned, and the gravy is bubbling. Serve hot! 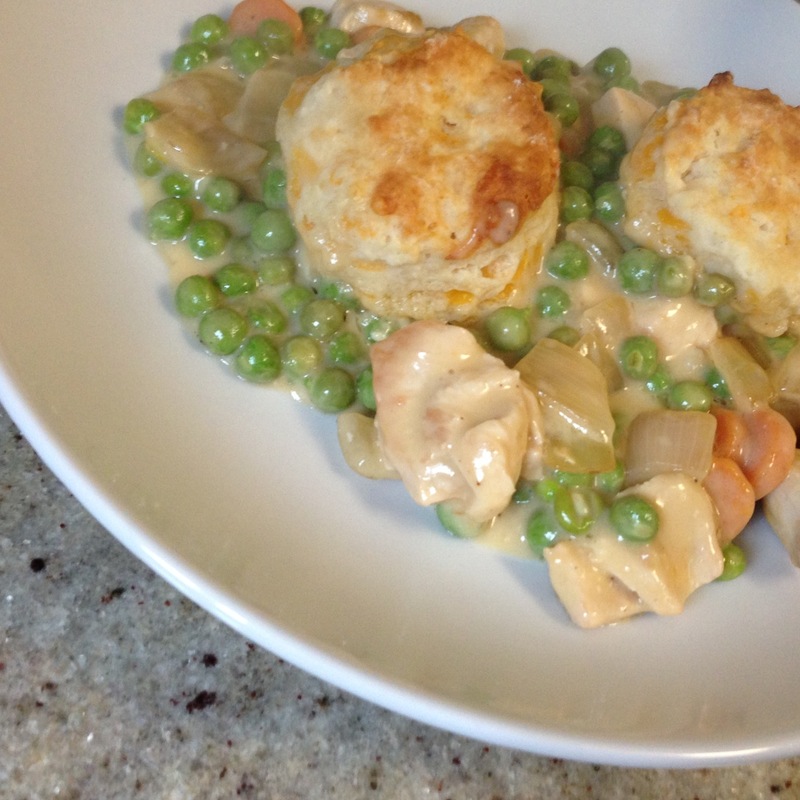 As I mentioned above, I don’t eat chicken pot pie (I am not a fan of gravy, and I’m not really fond of peas, either) – but my husband had nothing but great things to say about this dish. As a matter of fact, he ate 2/3 of the pan in a span of about 30 minutes! I would absolutely make it again, when we’re in need of some delicious comfort food – it’s even pretty enough to make for company! I’m so glad that you don’t like peas, I’ve been getting worried what with your love for cauliflower. I might actually try this but first I will have to sub all the veggies for something else (I also hate carrots). Just curious, did the other half of your blog partnership drop out? I even tried a couple peas as I was making this – since they were fresh, I thought they might sway me. Didn’t work. Still not my favorite. I would imagine you could sub in any vegetable that won’t fall apart after cooking for a while – some potatoes, small broccoli florets, green beans, etc. That is an excellent question. I believe she is on a break until further notice! 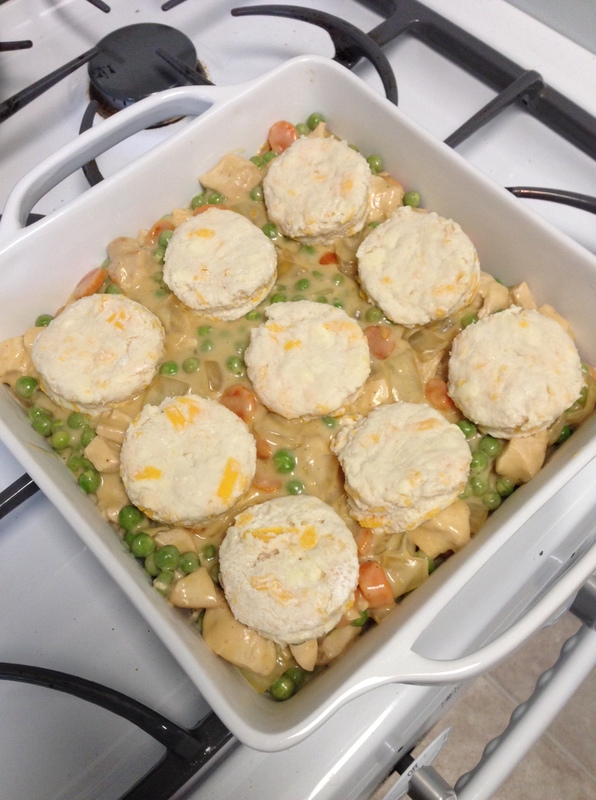 Does anyone actually like chicken pot pie that tried this recipe? I’d like to know more feedback before I try this recipe.